Achieving Costa Rica Independence was one of the most important events in Costa Rica’s short history. Unlike many of their neighbors, however, the Ticos managed to do it without bloodshed or revolution. While this is certainly a blessing, it does not mean that it was a simple process. In fact, they had to win their freedom not once, but twice! Up to this point, most of continental America to the south of the United States was part of the Spanish empire. The wealth generated from the work of the Latin Americans largely benefited only the Kingdom of Spain. Costa Rica was no different, and it formed part of the Viceroyalty of New Spain, a large territory which included the whole of Central America and Mexico. Over time, the people of Latin America grew tired of this arrangement. The voices calling for change became louder and louder. It wasn’t until 1808, however, that Spanish America would get its chance to break free. In this year, the French general Napoleon Bonaparte invaded Spain and deposed their ruling family. This is where it all began. The whole of Latin America was in revolt against Spain and cries for independence were creating a domino effect across the continent. It gave the Latin Americans a chance to rebel and all across the region independence movements formed. It was a long and hard-fought struggle, but eventually most of the Spanish colonies broke free. As part of New Spain, it was the Mexican war which was most important for Costa Rica independence. Luckily for the Costa Ricans, the province was the most remote part of New Spain. The fighting did not affect them directly and they avoided the violence which plagued places like Mexico and Peru. On the 15th of September 1821, the whole of Central America officially broke free from Spanish rule and was independent for the first time in its history. Thanks to its remoteness and the lack of technology at the time, the Ticos did not find out that they were independent until over a month later. The decision had been made in Guatemala and it took several weeks for the news to travel all the way down to Costa Rica. Nevertheless, when it finally did arrive, the news met with great celebration. 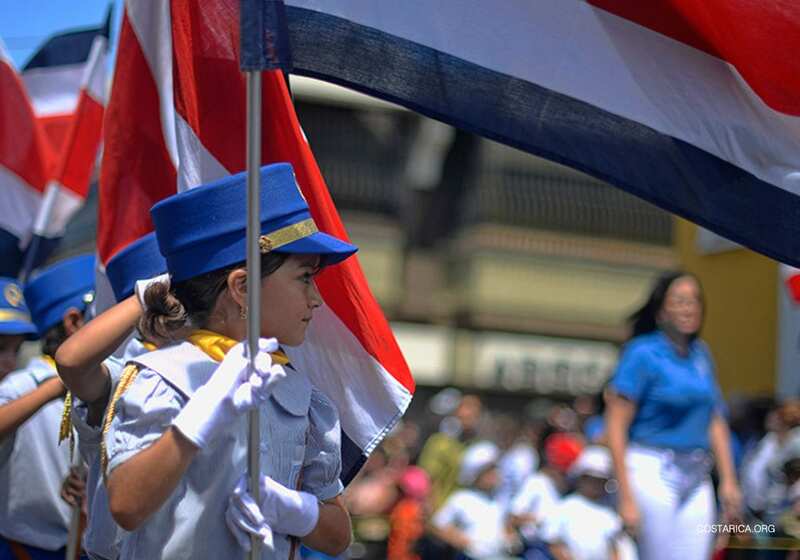 Today the 15th of September is still celebrated as the day of Costa Rica independence. It shares this date with Nicaragua, Honduras, El Salvador, and Guatemala. Every year the country closes its businesses for the day to focus on patriotic celebrations. Each town and city has its only street party with parades forming the main focus of the festivities. Everywhere you look, you will see people in traditional dress, as well as folk music and Costa Rican culinary delicacies. A few days earlier a torch’s lit in Guatemala and makes its way down Central America. This is a re-enactment of how the news of independence made its way through the different countries, and it culminates on the 15th by reaching the Costa Rican city of Cartago. The highlight of the day is the raising of the flag and the singing of the national anthem, but afterwards the party continues late into the night. Having won their freedom from the Spanish, Central America now had to work out how it wanted to govern itself. Things got a bit confused and tempers flared as everyone had different ideas about how they should do this. The countries we know today had never existed at this point. Instead, the territories were ruled by massive viceroyalties which encompassed very different groups of people. There was a great debate about whether these states would stay intact or break up into smaller units. If they were to break up, it was unclear how they should do this as there were no existing borders to use. Costa Rica had been part of the Viceroyalty of New Spain which extended all the way to the northern border of Mexico. The whole of Central America had declared independence together. There were differing opinions about whether sticking together was the best course of action. They formally united with Mexico but had won their independence separately. Because of their shared history, Central America and Mexico briefly reunited but after just two years they split off again from their northern neighbor. The remaining countries formed the Federal Republic of Central America and so, while independent from Spain, Costa Rica was not a sovereign nation. The Republic was ruled from Guatemala (and later El Salvador), and each of today’s countries became states. Within Costa Rica, this political situation created a lot of division with some supporting unification and others favoring independence. Only a few years later, the independence of Costa Rica was threatened when William Walker and its army tried to conquer Costa Rica by invading through Guanacaste. Civil war broke out and William Walker’s army was pushed back to Nicaragua at the Battle of Rivas. It was here that Juan Santamaría advanced and was able to set the barricades of the enemy on fire. Because of this, the Costa Ricans were able to win the battle and Juan Santamaría is now part of Costa Rican culture as a celebrated national hero. Differences were mirrored across Central America, and the two camps developed in parallel with the existing debate between liberals and conservatives. The liberals supported unification, and the conservatives wanted independence. The president of the republic for much of its existence was a Honduran named Francisco Morazan. He strongly supported unification and campaigned all over Central America in its favor. He faced strong opposition all over Central America however, and things came to a head in 1838 when Nicaragua declared independence. Costa Rica and Honduras followed their example, and the Republic fell apart. Costa Rica finally became a fully independent nation and remained so ever since. Within this, Costa had its own battle between the radicals and the conservatists. Cartago along with Heredia favored imperial interests and wanted to join Mexico. San Jose being the radical rebel, demanded full independence and eventually won the argument, becoming Costa Rica’s new capital to boot. In following decades, there were several attempts to reunite the Central America countries. These have always ended in failure, and during one of them, Morazan was killed as he tried to reconquer the country. Costa Rica’s the most independently minded of the Central American nations. Also, fiercely proud of its independent status and the sacrifices made to achieve it. In fact, in 1948 José Figueres Ferrer led an uprising in the wake of a disputed presidential election. More than 2,000 people died. The 44-day Civil War was the bloodiest event in recent Costa Rican history. The new constitution guaranteeing free elections with universal suffrage and the abolition of the Costa Rican military. Figueres became a national hero and in 1953, he won the first election under the new constitution. Ever since that time, Costa Rica has been one of the few democracies to run without a standing army, a fact they are still admired for. The nation has known 16 successive presidential elections with the latest being in 2018. Today, more and more call for reform is hitting Costa Rica news. The government is slowly taking further steps towards improving on its human rights.